The tag 'CIA' is associated with 622 posts. A “New York Times” article spun the presence of Ukrainian power brokers Serhii Lovochkin (also transliterated as Serhiy Lyovochkin) and Andrii Artemenko at Trump’s inauguration as proving “Russian” collaboration. In FTR #967, we documented that Artemenko networked with Trump’s spook point man Felix Sater in an ANTI-Russian conspiracy, as well as the fact that Artemenko was a member of Pravy Sektor, one of the OUN/B successor organizations that came to power through the Maidan coup. The “Gray Lady” predictably failed to note that fact. In FTR #1022, we noted that Lovochkin and his sister are deeply implicated as collaborators of Manafort in the Maidan sniper provocation which brought Pravy Sektor, Svoboda, the Azov Battalion milieu and the other OUN/B successor organizations to power in Ukraine.We further documented this connection in FTR #1023. In his book–one of the most important in recent memory–Yasha Levine sets forth vital, revelatory information about the development and functioning of the Internet. Born of the same DARPA project that spawned Agent Orange, the Internet was never intended to be something good. Its generative function and purpose is counter-insurgency. 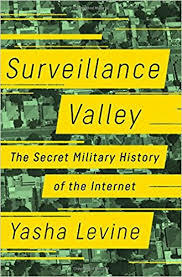 In this landmark volume, Levine makes numerous points, including: The harvesting of data by intelligence services is PRECISELY what the Internet was designed to do in the first place. The harvesting of data engaged in by the major tech corporations is an extension of the data gathering/surveillance that was–and is–the raison d’etre for the Internet in the first place. The big tech companies all collaborate with the various intelligence agencies they publicly scorn and seek to ostensibly distance themselves from. Edward Snowden, the Electronic Frontier Foundation, Jacob Appelbaum and WikiLeaks are complicit in the data harvesting and surveillance. Snowden and other privacy activists are double agents, consciously channeling people fearful of having their communications monitored into technologies that will facilitate that surveillance! This is the fourteenth of a planned long series of interviews with Jim DiEugenio about his triumphal analysis of President Kennedy’s assassination and New Orleans District Attorney Jim Garrison’s heroic investigation of the killing. In this program, we highlight the media hatchet men who worked hand in glove with the intelligence community infiltrators set forth in our previous interview. Many of the hatchet men also worked with each other, as well as the intelligence community. Most significantly, both the intelligence community infiltrators and the media hatchet men worked with Clay Shaw’s counsel and freely broke the law. In addition to a CBS special that aired at the same time (1967), NBC broadcast an outright hatchet job on Garrison presided over by Walter Sheridan. A veteran of the intelligence community, Sheridan had worked for the FBI, the Office of Naval Intelligence (ONI) and was a principal figure in counter-intelligence for the National Security Agency. As will be seen below, Sheridan reputedly had strong, deep connections to CIA itself. Destiny Betrayed by Jim DiEugenio; Skyhorse Publishing [SC]; Copyright 1992, 2012 by Jim DiEugenio; ISBN 978-1-62087-056-3; p. 255.
. . . . The conventional wisdom about Walter Sheridan places him as a former FBI man; reportedly he worked at the Bureau for about four years. . . .
. . . . Sheridan’s ties to the intelligence community, beyond the FBI, were wide, deep, and complex. He himself said that, like Guy Banister, he had been with the Office of Naval Intelligence. Then, after he left the bureau, Sheridan did not go directly to the Justice Department. He moved over to the newly established National Security Agency. This was a super-secret body created by President Truman in 1952 both to protect domestic codes and communications and to gather intelligence through cracking foreign codes. It was so clandestine that, for a time, the government a tempted to deny its existence. Therefore, for along time, it operated inalmost total secrecy. Neither the Congress nor any fedreal agency had the effective oversight to regulate it. . . . It is worth noting that–in addition to Sheridan’s deep intelligence background–NBC itself had strong, deep connections to the intelligence community. . . . .
. . . . It is relevant to note here that General David Sarnoff, founder of NBC, worked for the Signal Corps during World War II as a reserve officer. In 1944, Sarnoff worked for the complete restoration of the Nazi destroyed Radio France station in Paris until its signal was able to reach throughout Europe. It was then retitled Radio Free Europe. He later lobbied the White House to expand the range and reach of Radio Free Europe. At about this point, Radio Free Europe became a pet project of Allen Dulles. Sarnoff’s company, Radio Corporation of America, became a large part of the technological core of the NSA. During the war, David’s son Robert worked in the broadcast arm of the Office of Strategic Services (OSS), the forerunner of the CIA. Robert was president of RCA, NBC’s parent company, at the time Sheridan’s special aired. David was chairman. . .
Destiny Betrayed by Jim DiEugenio; Skyhorse Publishing [SC]; Copyright 1992, 2012 by Jim DiEugenio; ISBN 978-1-62087-056-3; p. 256.
. . . The company was International Investigators Incorporated, nicknamed “Three Eyes.” According to a Senate investigator, “it was owned lock, stock, and barrel by the CIA.” Two of the original principals, George Miller and George Ryan, were, like Banister, former G-men who later went to work for CIA cover outfits. According to another source, not only was Sheridan the liaison to Three Eyes, he “disposed over the personnel and currency of whole units of the Central Intelligence Agency out of the White House.” By 1965 . . . Three Eyes was taken over by two former CIA officers. One of them, Beurt Ser Vaas, later purchased the Saturday Evening Post. . . .
Exemplifying Sheridan’s methodology was the treatment meted out to Fred Leemans, who was the climactic person interviewed by Sheridan in his special. Note the open intimidation of Leemans and his family, threatening them if they did not perjure themselves, betray Garrison, and cooperate with both Sheridan and Clay Shaw’s counsel! This is reminiscent of the treatment of Marlene Mancuso detailed in our previous interview. Destiny Betrayed by Jim DiEugenio; Skyhorse Publishing [SC]; Copyright 1992, 2012 by Jim DiEugenio; ISBN 978-1-62087-056-3; pp. 240-241.
. . . . One of the more startling declarations that the ARRB uncovered was an affidavit by a man named Fred Leemans. Leemans was a Turkish bath owner who originally told garrison that a man named Clay Bertrand had frequented his establishment. Leemans was the climactic interview for Sheridan’s special. He testified on the show that the DA’s office had actually approached him first, that he never knew that Shaw used the alias Bertrand, that everything he had previously said to the DA’s office were things he was led to say by them, and that they had offered to pay him 2,500 dollars for his affidavit in which in which he would now say that Shaw was Bertrand and that Shaw came into his establishment once with Oswald. In other words, all the things Novel had been saying in his public declarations about Garrison were accurate. At the end of his interview, Leemans told Sheridan and the public that everything he had just revealed on camera was given to NBC freely and voluntarily. Leemans even said that he had actually asked Sheridan for some monetary help but Sheridan had said he did not do things like that. This is one of the most revealing documents portraying the lengths to which Sheridan would go in tampering with witnesses. It also demonstrates that Shaw’s lawyers—Bill and Ed Wegmann, Irvin Dymond, and Sal Panzeca—knew almost no boundary in what kind of help they would accept to win their case. Third, it reveals that Shaw’s lawyers had access to a network of attorneys that they could hire at any time for any witness they could pry loose from Garrison. Because, as the declassified ARRB documents reveal, there was a CIA cleared attorney’s panel that was at work in New Orleans. Attorneys that the Agency vetted in advance so they would be suitable for their covert use and could be trusted in their aims. The fact that Shaw’s lawyers were privy to such CIA secret knowledge, and wee utilizing it, shows just how willing and eager they were to indulge themselves in covert help—and then lie about it. . . . In addition to Sheridan, James Phelan and Hugh Aynesworth joined the media chorus attacking Garrison, and both of them networked with the intelligence community as well. Phelan’s hit piece was published in the Saturday Evening Post, which was eventually bought by CIA veteran Beurt Ser Vas, an alumnus of the Sheridan-linked Three Eyes intelligence front. 1.–William Martin, who infiltrated Garrison’s team, apparently on behalf of CIA. 2.–Bernardo DeTorres, a Bay of Pigs veteran and CIA operative with connections to Mitchell Werbell, a silenced weapons expert best known as the inventor of the Ingram Mac 10 and Mac 11 silenced machine pistols. DeTorres was filing reports on Garrison with the CIA’s JM/Wave station in Miami and was apparently in Dealey Plaza on 11/22/1963. CIA operative Eladio Del Valle–David Ferrie’s case officer on some missions–was found dead shortly after Ferrie. Del Valle was found tortured, shot through the heart and with his head split open with a machete. The corpse was a short distance from DeTorres’ apartment. DeTorres was also allegedly involved with the assassination of Orlando Letelier. 3.–William and Louis Gurvich, two “private investigators” who infiltrated Garrison’s office and, among other things, began channeling information about Garrison’s probe to Walter Sheridan, about whom we will have more to say later. William stole Garrison’s investigative file and gave it to Clay Shaw’s defense team. William Gurvich continued to work with Clay Shaw’s defense through 1971 (Shaw was charged with perjury). Gurvich may well have worked for CIA. His work with Shaw is in keeping with a Richard Helms directive summarized in item #6 below. 4.–Bill Boxley worked to steer Garrison’s investigation into dubious areas. When Garrison’s team visited Boxley’s apparent place of residence, it appeared not to have ever been occupied by Boxley. Boxley carried a number of briefcases with him when working with Garrison, growing larger with time. It appeared that he was purloining documents from Garrison’s office. Eventually, he called Garrison, warning that “we” are coming to get you. 5.–Tom Bethell, an Englishman and an assassination expert, met with Sal Panzeca, one of Clay Shaw’s attorneys and gave him a list of Garrison’s witnesses and summaries of what each was expected to say. 6.–Pershing Gervais was recruited to ensnare Garrison in a purported scandal after the Clay Shaw trial, in keeping with Richard Helms’ directive that the CIA take steps to neutralize Garrison and any effect that he might have before, during and after the Clay Shaw trial. He decamped to Canada, to be beyond Garrison’s legal reach, working at a job at General Motors secured for him by The Powers That Be. Later, he admitted his perfidy. 7.–One of the most important infiltrators was Gordon Novel, a veteran CIA officer, brilliant electronics expert and operational associate of many of the people involved in Garrison’s probe. Novel had been involved with the Bay of Pigs and an arms burglary at a Schlumberger facility, some of the loot from which was stored at a racing business owned in part by Novel. Operating at the direction of Allen Dulles, he infiltrated Garrison’s investigation and bugged his office for the Agency. He also networked with the FBI to monitor Garrison’s probe. Novel also used his position inside Garrison’s probe to smear Garrison in public statements to the media. Novel was able to draw on large financial reserves, the source of which is–technically speaking–opaque. At one point, he had five attorneys working on his behalf. That, in and of itself, would have required more money than Novel appeared to have at his disposal. Most significantly, Novel worked in tandem with Walter Sheridan, a veteran intelligence operative who produced an altogether “special” for NBC about the Garrison investigation. We will discuss Sheridan at greater length in our next interview.